Monday is the big kickoff to my 18 weeks of marathon training. Instead of doing too much running this week, I am instead mentally preparing for what is to come and also giving myself a tiny break before the big works begins. I have modified Hal Higdon’s Novice 2 to suit my needs. Week Mon. Tues. Wed. Thur. Fri. Sat. Sun. 18 Rest Rest 5 Rest Rest 2 RACE! After filling out the tables on my plan I am surprised at the massive mileage I will be expected to run over the course of the next eighteen weeks (even though I’ve done it before). Of course, I will constantly be checking in, giving myself breaks when needed and/or modifying based on schedules and sick kids and all the other life issues that infringe on my running time. 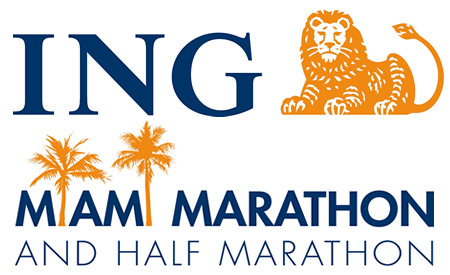 Note that I have accounted for the City of Oaks Half marathon (week seven), Thanksgiving (week 10) and also for the final weeks of training when I have a feeling I will want to run shorter mid-week distances more often (weeks 13 and 14 for sure, 11 and 12 are tentative). Are you in training? What does your plan look like? Anyone running Miami and feel like being a virtual buddy? 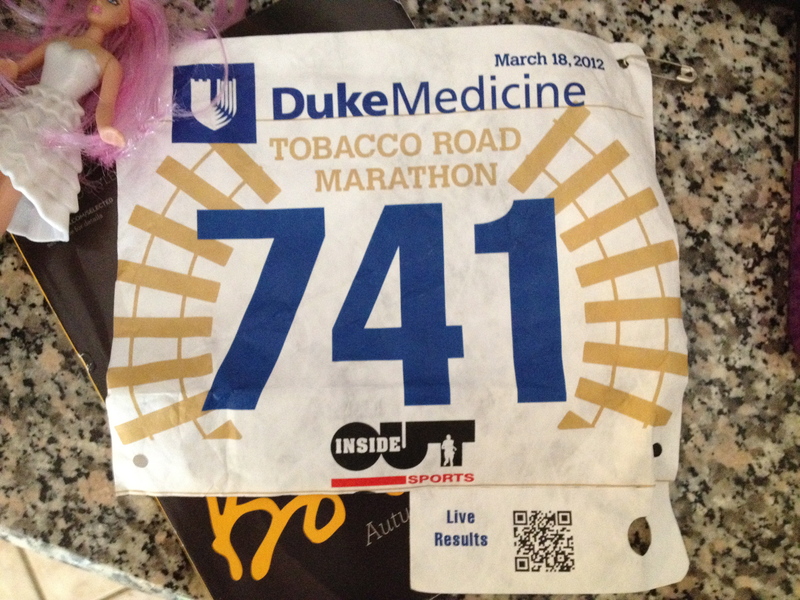 My bib from marathon #1. Can’t wait for Miami’s. It turns out that one of the nicest pastimes for a mom at home with kids is blog surfing. It’s cheaper than Internet shopping and fills that lonely place inside that vies for adult conversation. I wished I’d discovered it sooner. In honor of some of the fabulous bloggers who have inspired my own posts, made me laugh out loud, and sent words of encouragement based on things I’ve written, I decided I should list my favorites. 1. Acoursetothefinishline.wordpress.com Theresa writes about training for a marathon while working in education and struggling with infertility. We have a lot in common, since I myself survived the last two. 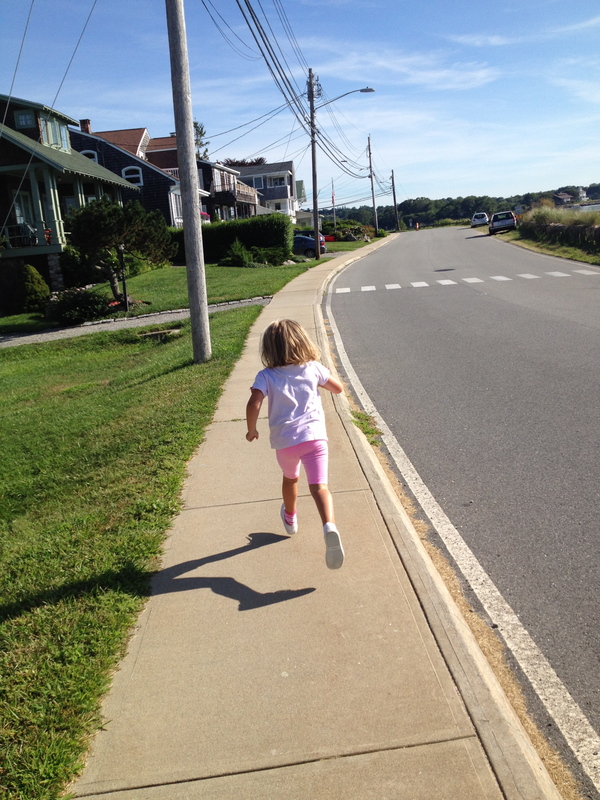 It turns out that she is a bit ahead of me on the marathon training front (we both are using Hal Higdon’s Novice 2), so she’s been a real asset with tons of good advice! Also, I love love love her wit! As I continued to read and we began corresponding a bit, I’ve found that she is also a super girl. My first blogger friend! I think we should all send her positive sticky baby vibes…. she is ready and deserves one! 2. Losingweightinthecity.com Theodora is one of the first bloggers whose posts I ever read. She had me hooked from the beginning with her story of initial weight loss while living in New York City to her running adventures, most recently with the New York Marathon. I love her writing and also live vicariously through her, since my own time as a young woman in NYC ended over 12 years ago. Scary how time flies! 3. Littlebittybakes.com Liz is adorable! A runner and a baker, she blogs about her life and her recipes. I love her pictures and her passion for what she does. For me, a true disaster in the kitchen, I feel like her recipes are do-able; not too hard for the average bear, like me. I am dying to make her Chai Spice Oatmeal Crispies. Also, could her URL be any cuter? 4. Monicarodgers.wordpress.com Monica is one of two bloggers (on the list) that I actually know in real life. We grew up together during our Summers in Maine, but I put her on my list because I love her voice, her writing, and her take on life. She is incredibly talented in so many areas, most especially as a mom, which is evident throughout her blog. Check out her car seat covers, her photography, her musings. She’s amazing! 5. Examiner.com/running-in-new-york/lora-johnson How could I not include Lora? She is the main reason my readership has gone up and writes her own terrific blog full of really great running information. A lot of her information is regarding area specific (Brooklyn) races, but she also has written some terrific pieces about helping women runners stay heathy and (one of my favorite topics) cool running gear. 6. Aliontherunblog.com Ali’s writing cracks me up. She is a runner who lives with Crohn’s disease and has raised money through Jack Rabbit Sports’ organization called Run For The Rabbit. She was chosen to represent them and her charity is the Crohn’s & Colitis Foundation of America. One of my oldest/dearest/bestest friends in real life lives with Crohn’s, so I feel strongly about Ali’s cause. Plus, she sells adorable I Heart Sweat running shirts, with the proceed’s going toward the charity! 7. Cleaneatingchelsey.com Chelsey has the most positive and healthy relationship to food that I’ve found in a blog! As her URL proclaims, she eats clean, but her good habits were spurred by a corn/gluten/lactose intolerance. Despite it, though, I never get the feeling that changing her diet was/is a chore. She loves food and doesn’t eat stuff out of a box! One day I hope to be more like her. Until then I’ll keep reading her blog for motivation and hope that one day her philosophy might rub off onto me and my not so great eating habits. 8. Cafeganesh.com Jennifer is the second blogger that I actually know is a real person. She is a yoga teacher in Raleigh and a Lemondead (Lululemon girl to my non-Lulu obsessed readers). I have been lucky enough to attend two of Jennifer’s classes, but haven’t been to more, solely because this marathon training is a real time sucker. When I saw her last (at the store) she reminded me that I really should come back, and she is right. Until then, I’ll keep reading her blog which is filled with fantastic posts like Pull Your Head Out of Your Asana! She has a great voice; knowledgable about her work and hilarious, too. Hope you enjoy these writers as much as I have. Sophie woke up at five complaining that her ear popped. Sure sign of an ear infection, which requires an early morning trip to the pediatrician. Today is a rest day and I’m glad. I myself woke up feeling a little weary. I skyped with my sister Gabby last night and told her about my day. She worries that I’m pushing myself too much and doesn’t quite get the whole, “training for a marathon,” thing. I hope she’s not right. I have a tendency to, “burn the candle at both ends,” but training for a marathon is supposed to be taxing, right? Especially living in Mommyland, right? After our talk, I went back to look over my training plan and I’m pretty sure I need to adjust. I like the Hal Higdon Novice 1 because it seemed “do-able,” but Novice 2 looks closer to where I am. Novice 2 bumps up the mileage about week 7, which is a concern because I’m trying hard to adhere to the 10% rule. This leads me back to Gabby’s question, “Am I pushing myself too much?” I’m in a quandary. I think I’ll stay on target for the rest of this week. Tomorrow I’ll run 5, vinyasa yoga on Saturday, with Jen at Evolve Movement, and an 11 mile (long) run on Sunday. My weekly total will be 27. I’ll see how I feel on rest day Monday and then change-up the training plan if necessary. Today I’ll take care of the girls, maybe do some laundry, eat right and try not to dwell on the uncertainty that comes along with this endeavor. Today is a rest day and rest days are hard for me. I feel strong, so I want to run! I know, though, that in order to ensure I’ll get through marathon day without injuries (or at least as few as this old bod can manage), I’ve got to follow the rules. As I mentioned in my first post, I’m following the Hal Higdon Novice 1 training plan. The plan starts with lower weekly mileage than I’ve been running, so I began at week 8. I spoke to my endocrinologist about this and he agreed that I should start where I actually am, and not go backward. My long runs, before making the final decision to run a marathon, were about 9-10 miles. I’ll probably run 10 one week and then bounce down to 6-7 and work my way back up until I actually hit Novice 1 week 8. In addition to HalHigdon.com, I like the mileage build up plan on marathontraining.com. I started in the middle of the build up plan too, but I’m not sure if i’ll be able to keep up with the actual marathon training plan. It’s really long mileage, much longer than the Novice 1. I’ve looked at lots of other plans, including Runner’s World and Jeff Galloway, but the two I’m sticking with at the moment seem to be working. A good friend of mine told me to find a group to run with. Unfortunately, the Jeff Galloway group is winding down it’s season. The other groups in Raleigh have runs that won’t work with my lovely schedule. A few mom’s at the girls’ pre-school have offered to run with me, but I know for a fact that they are MUCH faster than me. It is possible to run with them, during the week, but, I’m such a chicken. I don’t want to hold them back or to push myself too hard. No, at this point I’m going to go it alone. I won’t lie though, it would be nice to share the experience with some like minded mama’s! You are currently browsing entries tagged with Hal Higdon at Running in Mommyland.